A follow up on the post on Evernote vs. OneNote for Android. This post looks at the note creation features of the Microsoft OneNote 2013 RT that is included in the Microsoft Surface RT tablet and the Evernote app that is available from the Microsoft Store. The OneNote app that is included with the Surface has about the same feature set as the normal Desktop version of the Office 2013 suite. It runs in desktop mode on the tablet and has all the desktop like interactions and features of the Office 2013 for RT apps. Evernote is a Microsoft Store App that runs in the ‘Modern UI Style’ (formerly known as Metro) which means either full screen mode or Snap mode where one app is snapped to one edge of the screen. In snap mode it is easy to take notes at the same time as another app is open and visible. Finding existing notes in Evernote uses the same search functions as all Windows Store Apps, by opening the charms menu there is a search option for Evernote and all other Apps available. Compared to the search options in the Desktop app and the Android app this is quite a poor experience. It is not possible to save searches to create dynamic lists of posts and it is not possible to save the search as a short cut anywhere. 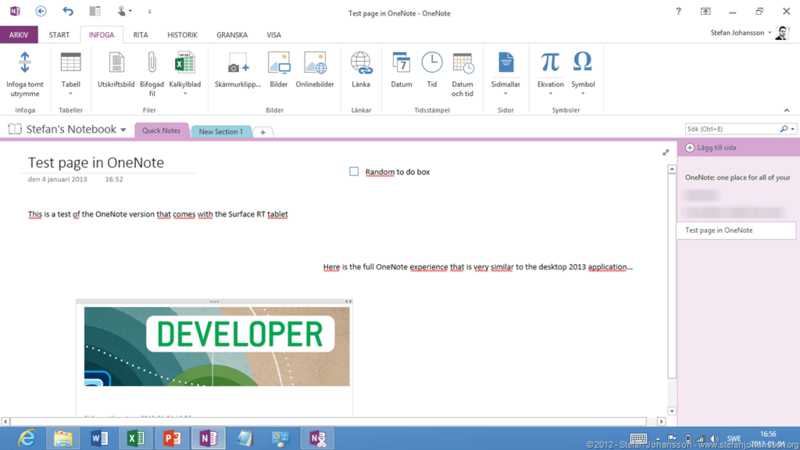 The interface in OneNote is very similar to the Windows Office 2013 Desktop Application. The App runs in window mode and can be resized and moved at will. Created of notes can include any formatting and object supported. it is easy to insert screenshots with the clipping tool etc. 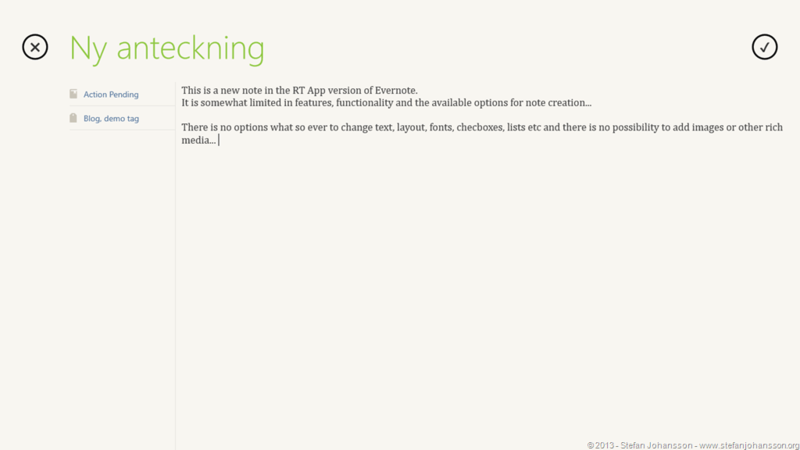 The Evernote note creation experience is of the less is more variant. There is only plain text input and the only extra options is to choose the notebook the note should be in and the tags to associate with the note. It is possible to put the note creation interface on either edge of the screen using Snap and use the rest of the screen for another App. 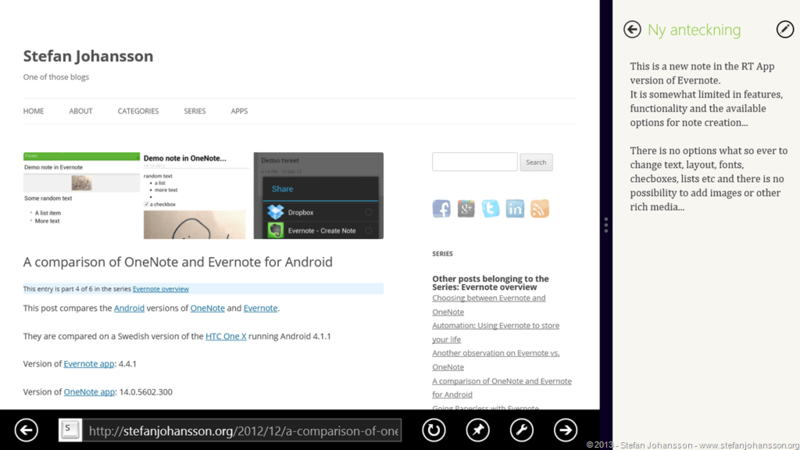 Snap example, use part of the screen for Internet Explorer and part of the screen for Evernote note. 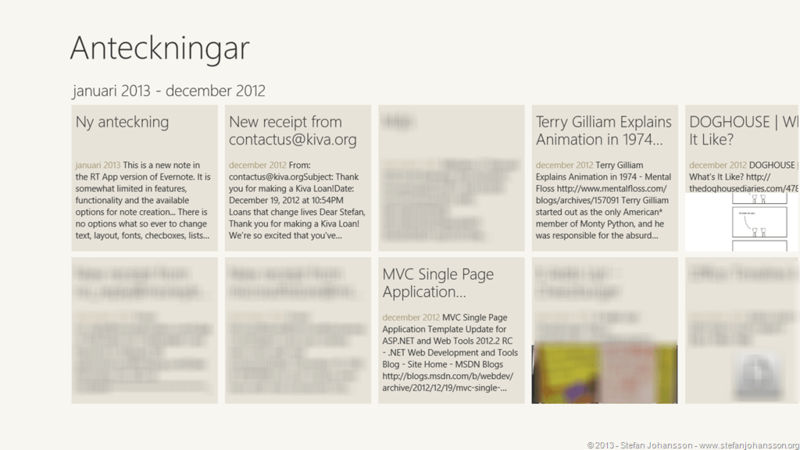 The normal view when opening Evernote includes squares of all recent notes. The opportunity to change view is somewhat limited. by opening the menu options, it is possible to change view based on notebooks and tags and it is possible to change sort order. 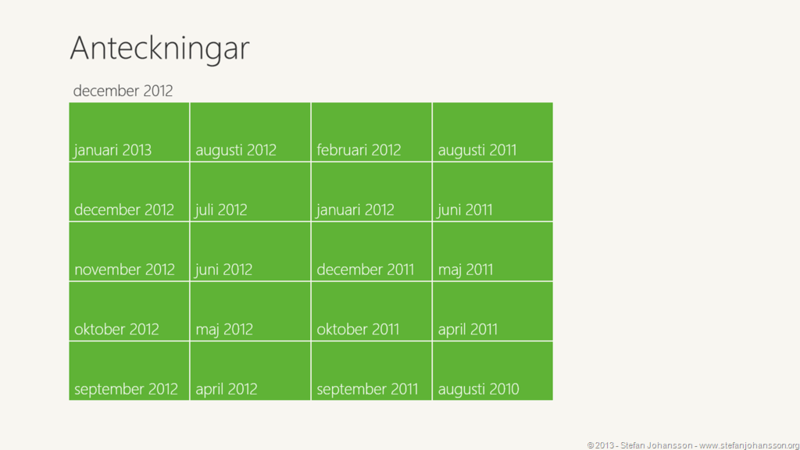 It is also possible to zoom out and view navigation based on months. This entry was posted in General and tagged App, Comparison, Evernote, OneNote, Windows RT on 2013-01-05, Saturday by Stefan Johansson.